A Thing for Roses: Go Beavs! I can't believe it is Sunday already. This weekend is flying by. Friday I was all ready to go walking, maybe hit a few garage sales, work on some projects, etc. Then I got called to work. Some of you reading my blog don't know this about me, but I am a substitute lunch lady. Yup! That's right, I prepare and serve food to school children. I was an actual regular lunch lady a few years ago, but I decided that I would just sub as I was too tired to work on anything else when I got off work. Being a lunch lady is much harder on you physically than you might think. You are constantly on your feet and there is actually quite a bit of heavy lifting. Anyway, after working on Friday, I was pretty tired so I didn't get much done that day at home. Saturday we were all up bright and early to go to my daughter's soccer game. They really played great and ended up tieing 2-2. 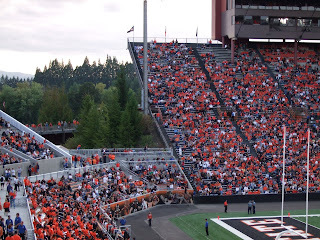 We then drove to Corvallis to visit our alma mater, Oregon State University, and attend a Beavers football game. 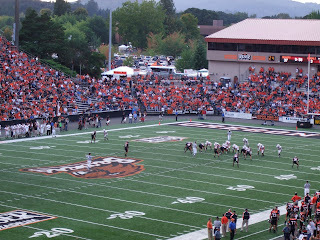 It was a perfect day weather wise and the Beavs were smokin! They were playing Idaho State and clobbered them. It was a really fun family day! We had never been to the new stadium and it was fabulous. The above pictures shows the view from our seats. Look at all the pretty trees in the background. See all the orange in the stadium. Everyone was wearing the school colors. It was so cool. My husband and I have no recollection of that much school spirit when we went there. Anyway, we try to get to OSU at least once a year. We would love for our kids to go there someday so we can visit them and stroll down memory lane which is what we always do when we visit. It really is a wonderful campus. Thought I would share with you a couple shots of where my two surprises ended up. At least for now. I have decided to keep the mirror, at least for awhile. I love looking at it and knowing that I uncovered its potential. ha ha I will definitely keep the roses print. I just cut the mat down and put it in a frame from my stash. I think I will try to find a place to hang it somewhere. I asked my good friend Joy if she would come by sometime soon to help me do some rearranging. I am getting tired of things where they are and need some new eyes to help me. 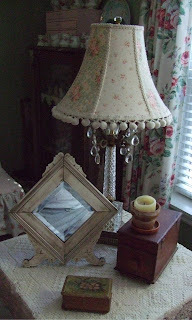 She does an amazing job of decorating and creating vignettes. Did I mention I am a Duck!!! Cool pictures of the stadium and your boys.. 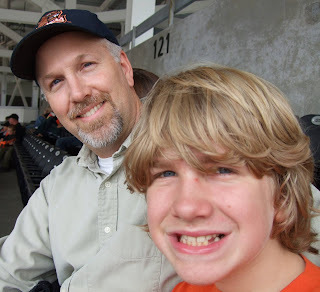 I did go to a few Beaver games in my past. Seems like all the men in my life have worn Orange!! I love the roses. I plan to take some pics of the dahlias my sister gave me yesterday..You will have to keep checking...I love flowers in the house but only when it is tidy. Its like the frosting on the cake.. Guess I better keep baking!!! A lunch lady is hard work...I used to be a teachers aid for many years and I loved our lunch lady, and she worked her fanny off too! I miss the kids...sometimes I think of going back! 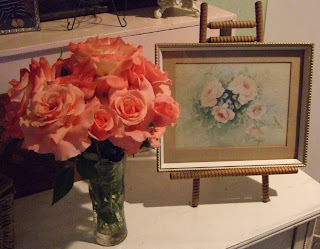 Love your roses print & your redo is fab...good job! 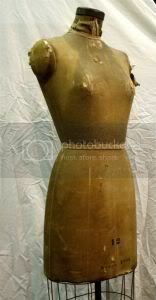 I also went to your friends blog...love her aqua & blue cupboard. I need to go to Oregon..haven't been in ages & I loved going there every summer as a kid! I just found your blog and I must say I love it. So many lovely things you show. I'll come back!! It looks like you had a wonderful time on Sunday! I love school spirit like that! It just makes the whole atmosphere so positive and FUN! Lisa, your rose print turned out cute in that little frame. What are you talking about? The way you have things displayed is adorable! So perfect! The frame is great and you neeeeeeeeeeed to keep it! I'm tellin' ya sister, you'll regret it if you sell it. I love visiting your blog! Have a wonderful week!